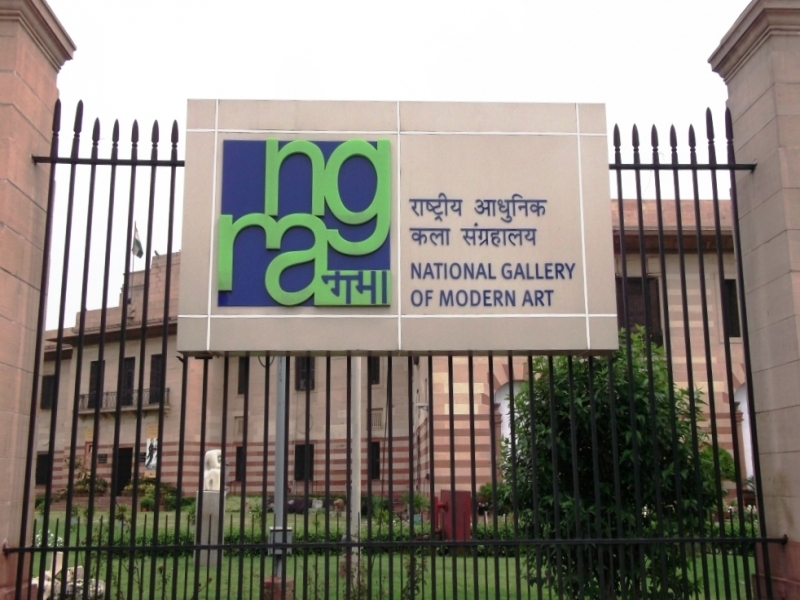 The National Gallery of Modern Art is located at Jaipur House, near India Gate, in New Delhi. The building was earlier the palace of the Maharaja of Jaipur. The gallery was inaugurated on March 29, 1954 by the then vice president of India, Dr S Radhakrishnan. It is administered by the department of culture of the Government of India. The gallery displays the changing art forms over the last hundred and fifty years, starting from about 1857, in the field of visual and plastic arts. The gallery has around 17,000 paintings, graphics, and sculptures of modern artists. These include the works of Raja Ravi Varma, Abanindranath Tagore, Nandalal Bose, Ramkumar Kinkar, Rabindranath Tagore and Binod Behari Mukherjee. The exhibits include sculpture, graphics and paintings by international modern artists such as Jacob Epstein, Giorgio de Chirico, Peter Lubarda and Kozo Mio. Also displayed are Amrita Sher-Gil's Self Portrait, Two Women, Musicians, Bathers and Jamini Roy’s Krishna and Balarama, Kirian, Yasoda and Krishna. Works of recent artists such as M F Husain, Vivan Sundaram, J Swaminathan, Ghulam Mohammed Sheikh and Bhupen Khakhar are also exhibited. The gallery also organises special exhibitions for artists who wish to exhibit their works. It also hosts exhibitions abroad, lectures and conferences on modern art, and maintains a library. German art historian Hermann Goetz (1898–1976) was the gallery’s first curator. He added new facilities such as art restoration services, an art reference Library and a documentation centre to the gallery. In 2009, the National Gallery of Modern Art got a new wing that added almost six times the space to the existing gallery. The new wing also has an auditorium, a preview theatre, conservation laboratory, library and academic section, a cafeteria and a museum shop. The government of India gave some objects of minor arts to the gallery free from its treasury because they were made after 1857. These include ceremonial chairs, silver salvers, richly embroidered velvet drapes and silver objects made for the 1911 Delhi Durbar and other vice regal durbars. Works of art were also obtained through purchases, permanent loans and gifts. One of the most valuable gifts is a body of work by Amrita Sher-Gil. It was gifted by her father Sardar Umrao Singh and brother-in-law KCK Sundaram. Her husband, Dr Victor Egan, sold 44 paintings to the gallery. The paintings were acquired between 1949 and 1950. The trustees of Rasaja Foundation have given a collection of 1,273 works on perpetual loan to the gallery. The collection, compiled by artist and art historian late Jaya Appasamy, includes works of indigenous artists of the 19th and early 20th centuries. The National Gallery of Modern Art has also collected, through purchases and as gifts, works of various European and Far Eastern artists. The exhibits include many works by European artists who visited India in the 18th and 19th centuries, and portraits and exotic scenes of India. Among them are the works of Tilly Kettle, William Hodges, Thomas Daniell and Emily Eden. The museum remains closed on Mondays and national holidays. Been to National Gallery of Modern Art ? Share your experiences!